The Tap Room at Colicchio & Sons is sleek and modern, just like the rest of the restaurant. The highly polished bar top holds elegant candles and a large floral arrangement. Underneath is a highly polished copper base and about a dozen custom wooden barstools. Three rows of spirits sit in front of the closet of wine that acts as the divider between the bar and the main dining room. Not one, but two bartenders look after your every need, ensuring that you never go too long without a refill. A riveted column separates the lounge area from the actual bar area -- providing both with that extra level of semi-privacy. 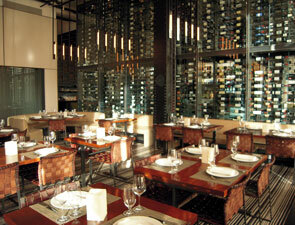 The wine cellar is just one of the focal points at Colicchio & Sons, as at its sister restaurant, Craft. This features a two-story glass chamber of wine bottles that houses what looks like more than 1,000 bottles of wine. 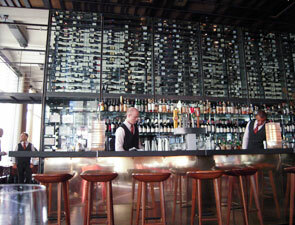 A circular catwalk allows servers to quickly access that special bottle that you're looking for. It’s the perfect way to store the wine and yet create a marvelous showpiece for the restaurant. The wine list itself at Colicchio & Sons is no less awe-inspiring, as it is extensive and encompasses wines from France, Italy, California, New York, Australia, Washington and beyond.